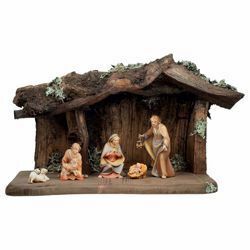 With its 45 statues and figurines, the handcrafted Modern style Nativity Scene Saviour cm 10 (3,9 inch), hand carved in wood, is a complete collection of original pieces for home indoor decorations. The Nativity Sets’ characters, the artistic backgrounds with stables and barns, the ornaments and accessories are handmade statuettes of great beauty. The small figures are carved in selected sycamore maple wood, painted entirely by hand with oil paint in such a way that the wood grain is preserved by the master craftsmen from Ortisei Val Gardena. Complete collectible Nativity Scene Modern style cheap wooden figurines for indoor decor, with an excellent quality/price ratio. 100% Made in Italy. Donkey - Statue in traditional style in maple wood. Ox - Statue in traditional style in maple wood. Balthazar Black Wise King standing - Statue in traditional style in maple wood. 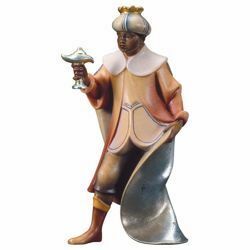 Caspar White Wise King standing - Statue in traditional style in maple wood. Melchior Saracen Wise King kneeling - Statue in traditional style in maple wood. Glory Angel - Statue in traditional style in maple wood. Kneeling lamb - Statue in traditional style in maple wood. Lying Lamb - Statue in traditional style in maple wood. Extension for Saviour Family Stable - for wooden Nativity Village. Extension for Arc Family Stable - for wooden Nativity Village. Guardian Angel with Girl - Statue in traditional style in maple wood. Cameleer with feed - Statue in traditional style in maple wood. Standing Cameleer - Statue in traditional style in maple wood. Standing Camel - Statue in traditional style in maple wood. Lying Camel - Statue in traditional style in maple wood. Shepherd dog - Statue in traditional style in maple wood. Saviour Family Stable - for wooden Nativity Village. Saviour Family Stable with extension - for wooden Nativity Village. Arc Family Stable - for wooden Nativity Village. Arc Family Stable with extension - for wooden Nativity Village. Goat and little Goat - Statue in traditional style in maple wood.